The Catalina luxury estate home in the coveted Cortile neighborhood in Mediterra Naples is ready to become your luxury custom home with a luxurious open floor plan, an asian-inspired contemporary interior design, and spectacular views of the nature preserves found in our luxury home community. 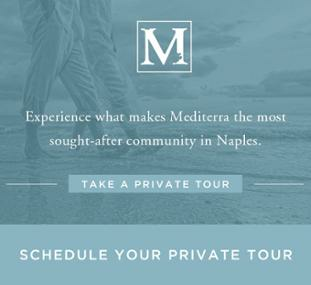 As one of the few remaining opportunities in the luxury maintenance free villa and estate home neighborhood of Cortile, The Catalina represents the luxury living lifestyle you’ve always dreamed of at the heart of Mediterra Naples. Walking up to the home provides a clear view of the brick detailed arched entry tower that is exquisitely framed with landscaping and two fountains on each side of the walkway before arriving at the 10-foot double glass-and-wood framed doors. Just past the double doors and the foyer, there is a great room that, thanks to London Bay Homes’ open floor plan design, seamlessly blends into the luxury kitchen and café. 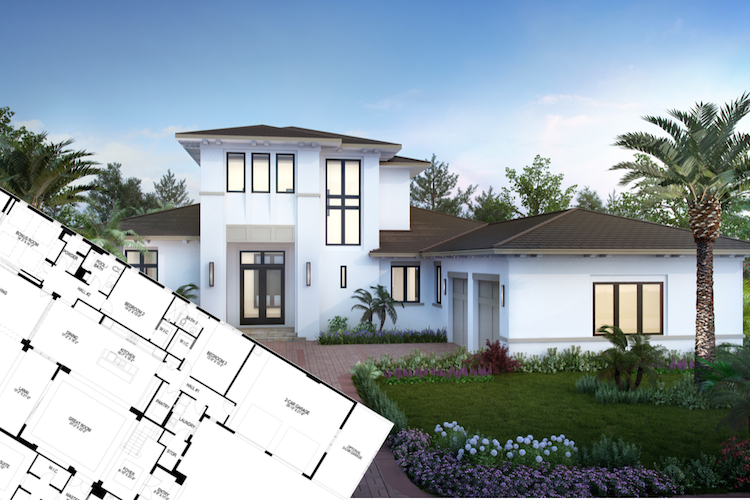 These spaces, as well as four bedrooms, five bathrooms, a formal dining room, bonus room, loft, and guest suites with en-suite bathrooms, are all part of the home’s 5,288 air-conditioned square feet. The in-house architectural designers at London Bay Homes provided a detailed floor plan that make luxury living effortless, but the designers at Romanza Interior Design brought the floor plan to life with a blending of rustic and eastern influences that are punctuated by Asian-inspired accessories and shapes. The designers selected furniture styles with clean and modern lines, a mix of finishes, including wood, glass, marble and metal, as well as textural and tactile elements to complement the luxury home in Naples. Tones of taupe, brown and off-white provide neutral backgrounds for a color palette of deep bronze, plum, and shades of green. Walking through the luxury estate home affords you a glance at the furniture stylings included to transform The Catalina house into a posh home, like the entry foyer’s wood and acrylic console and the dining room’s suspended floating ceiling detail with wood accents, modern starburst mirror, and teardrop-shaped, mercury gold glass wall sconces. The thought process behind these selections, and others in the home, is that the home’s aesthetics will play off the emphasis on bronze and light-reflecting metals, combining them with various luminous finishes and accent materials, such as the iridescent mosaic glass tile in the master bath. 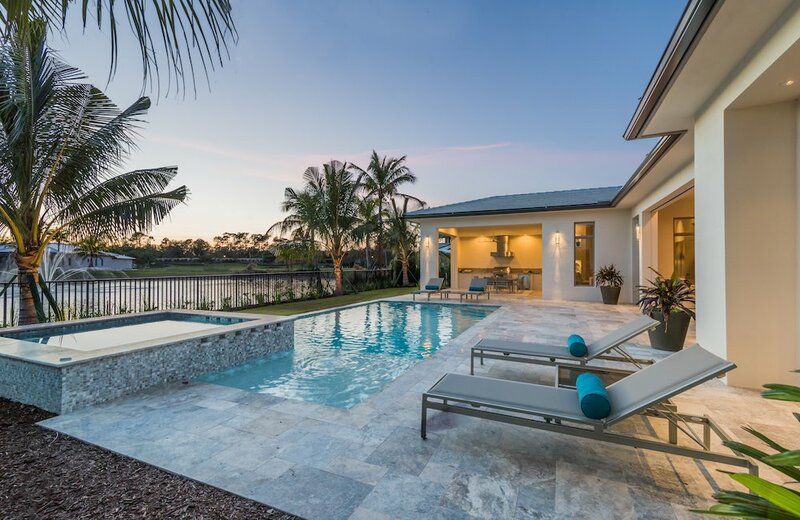 The luxurious contemporary interior design found within the home is complemented by the beautiful outdoor living space framed by Mediterra Naples’ lush nature preserves and golf course. Sliding glass doors in the café, large bonus room, and master bedroom take you to the 950-square-foot outdoor living space where you can swim laps in your resort-inspired linear pool to keep up your healthy living lifestyle, lounge on the sun shelf to soak up the sun’s rays, or ease the tension away in the raised spa with spillover. 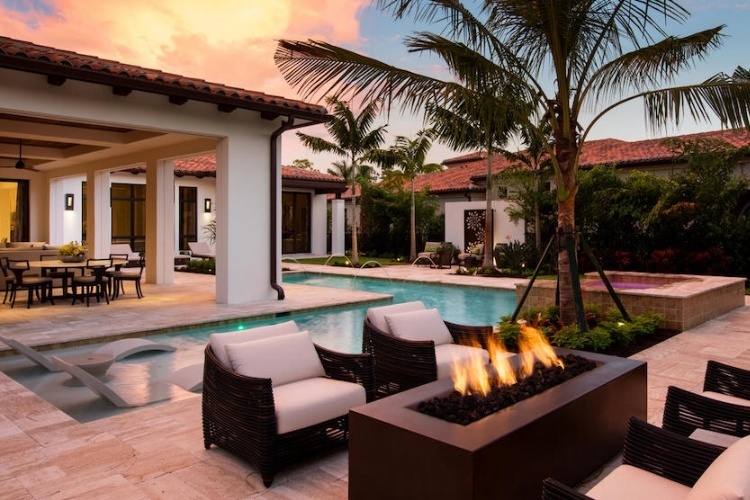 The outdoor space also includes wrap-around dining and sitting areas, and a summer kitchen with an island bar so you can enjoy al-fresco living and dining when the gorgeous weather in Naples Florida is at its peak. 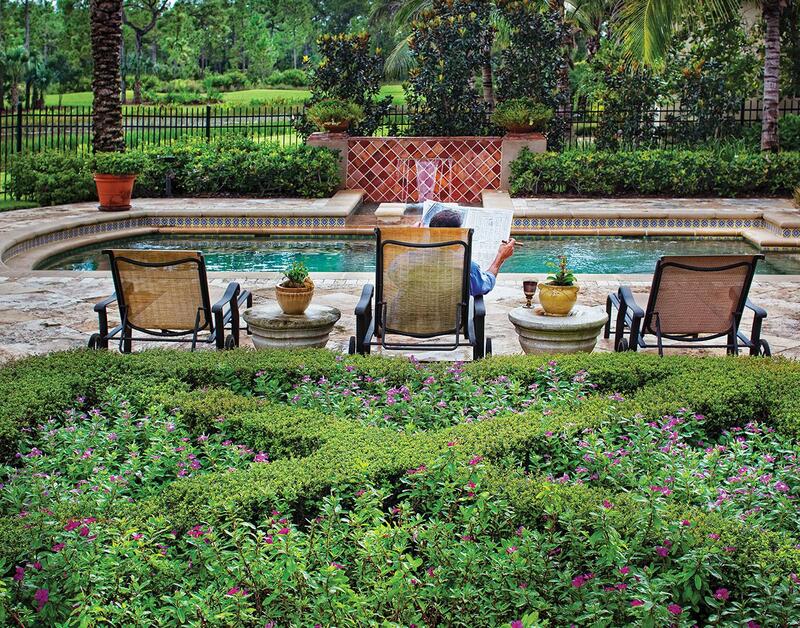 You can also head further out into your yard with “destination” sitting areas accented with sculpture and zen-like water sounds to promote a sense of peace and tranquility. Just outside of the master suite, located on a private wing of the first floor, are sliding glass doors that open up to a private patio with a landscaped cedar trellis and a private garden and outdoor shower enclosed by screen walls and an aluminum trellis to complete your outdoor oasis in this beautiful luxury estate home. When you head upstairs, you can take another look at your picturesque surroundings with a “sunset overlook” balcony right outside of the loft. 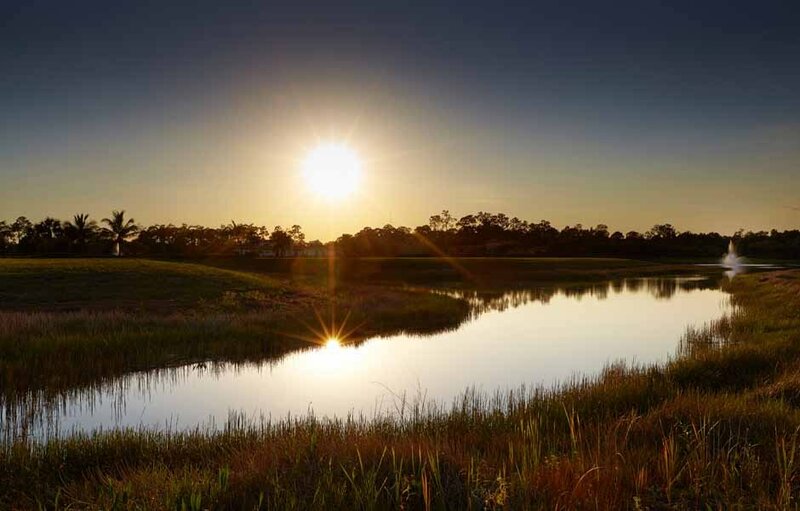 Here, you can watch the sunset, gaze at the stars, and take in the beauty of the nature preserves and golf course from an elevated perspective. 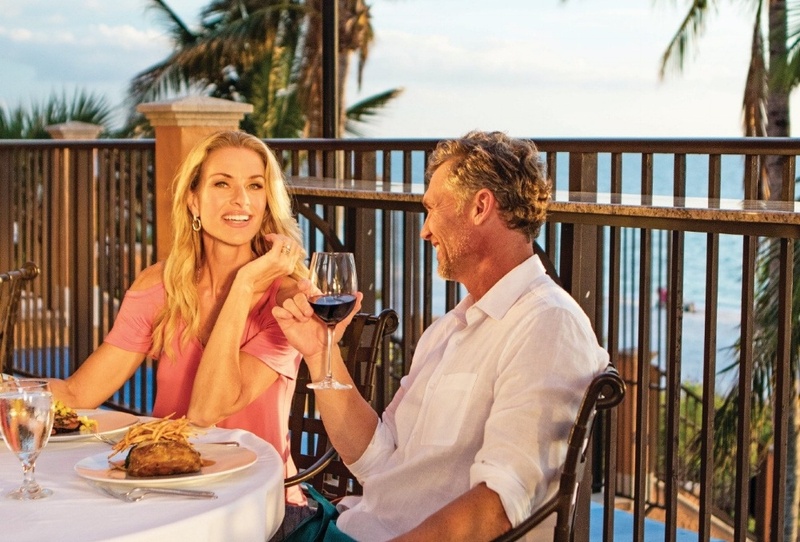 The balcony also has an outdoor fireplace that will create a cozy environment on the rare occasions when the Florida nights become a bit chilly. 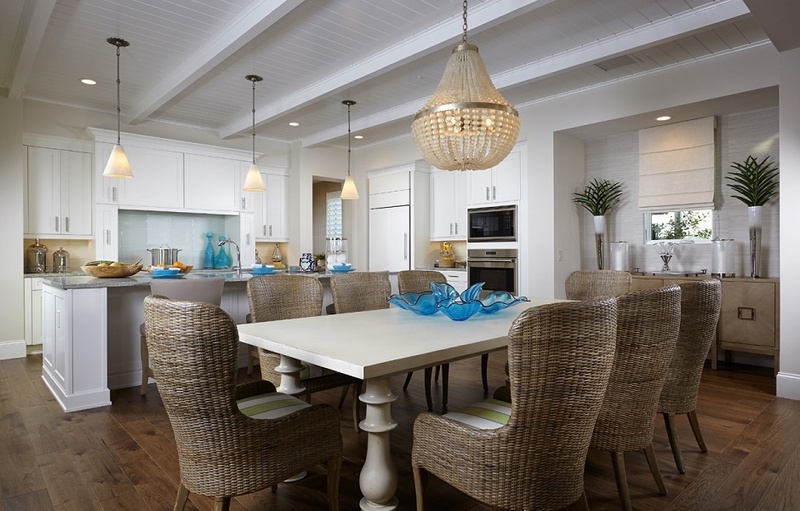 You can enjoy beauty and luxury inside and out when you choose The Catalina luxury home in Naples. Schedule your tour to see this luxury estate home up close and personal.